Artist's impression of Pluto and Charon as seen from one of Pluto's other moons. A new study provides the best estimate to date of the diameter and heft of Pluto's moon Charon and suggests the satellite likely has no atmosphere. Charon is the largest known moon in relation to the size of its host planet. 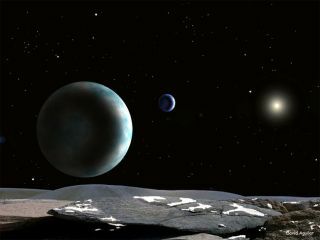 It is about half the size of Pluto and about eight times less massive. The new observations put Charon's diameter at between 750 and 753 miles (1,207 and 1,212 kilometers). Charon's density is 1.71 times that of water, which suggests its icy contents are just more than 50 percent rock, and about 10 percent less rock by mass than Pluto. Ironically, Charon's density is now known more precisely than that of Pluto. To take Charon's measure, astronomers used three telescopes to monitor an occultation, in which Charon eclipsed the light of a background star for about a minute. Only one other such rare event involving Charon has been witnessed. Pluto is known to have a very thin atmosphere, based on other occultation observations. If Charon has one, the new observations indicate, its pressure would be less than one-sixth of a millionth of the air pressure at the surface of the Earth. That would be 100 times less than the air pressure at Pluto's surface. "Comparing Pluto and Charon, we seem to cross a borderline between bodies which may have bound atmospheres—like Pluto—and airless bodies like Charon," said Olivier Hainaut of the European Southern Observatory. The leading theory for the formation of Pluto and Charon, along with two other small moons recently discovered, is that one object collided into another and the system coalesced out of the remains. "Our observations show that there is no substantial atmosphere on Charon, which is consistent with an impact formation scenario," said MIT researcher Amanda Gulbis, lead author of one of two papers in the journal.